If you're looking for a part for your snow machine, we can help you find it. Give us a call at (807) 768-7720 and talk to a real person! If no one is there, leave a message and we'll get back to you as soon as we can. 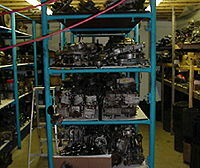 We carry a wide variety of used and new parts from leading companies! Tues. to Fri. 10a.m. to 6p.m.